Item 10 on meeting Agenda - Consideration and possible action regarding ratifying and confirming Resolution R2007-28, a Resolution of the City of Friendswood supporting the recommended Alternate Route 1 for the location of Brittany Bay Boulevard in the City of Friendswood from the League City, city limits to the intersection with FM 528. Brittany Bay Boulevard Presentation to City Council on March 20, 2006. Brittany Bay Overview as presented to City Council on February 20, 2006. Friendswood Major Thoroughfare Plan (6/28/05). Those interested in signing a petition against the proposed "red" route of the Brittany Bay Rd project, can contact JJ Brown at (281)648-1000. A discussion was held at the 8/29/07 WTHOA Board meeting regarding the Brittney Bay Road and potential tie-in to Castlewood. The board unanimously is against Britney Bay tying in to Castlewood and discussed ways to prevent this from occurring. The board agreed to follow-up on the City of Friendswood�s mayor proposal to deed over the land where Castlewood extends past Applewood. The HOA could then remove this portion of the street and extend the Applewood Park in an effort to prevent a future road tie in. Lisa Norwood (WTHOA Vice President) will contact the mayor and express the boards desire to accept his proposal. During the City Council Meeting on 4/3/2006, Chris Peden made a motion in support of calling a non-binding referendum regarding the expansion of Brittany Bay Blvd. The proposition was that this referendum be added to the ballot for the May 13th elections. The proposition failed since no other City Council Member seconded the motion. Many citizens also opposed the referendum, since they felt more information was needed to make an educated vote on the topic, and that the wording of the referendum would be critical. Concern over increased crime if the thoroughfare is built, since it would produce more through-traffic and easy in/out access for criminals. Friendswood Chief of Police, Bob Weiners, agreed that the increased through-traffic could pose an increased threat to security, but assured everyone that they have plans to control any increased activity associated with the expansion. Concern over who (if anyone) will actually benefit from the extension of Brittany Bay Boulevard. Many citizens present felt that the extension of Brittany Bay would primarily benefit commuters from League City and Alvin, but was not of sufficient benefit to Friendswood citizens to warrant the potential increased risks to security and loss of personal property. Concern was also expressed over whether the proposed routes would even pass the Preliminary Engineering/Environmental Analysis (PE/EA), since portions of the land that will be used for the proposed routes was previously oil fields that are contaminated and can not be used for residential or commercial purposes where people or animals could dwell. Some citizens questioned why these routes are re-surfacing now, after they thought the decision to go with the purple route was made back in 1998 at the recommendation of the advisory committee. The reason given was that the addition of the retention ponds near 2351 forced a re-design of the proposed route. Many citizens were frustrated by the length of time (and amount of money spent during that time) the proposed routes have been under evaluation, and yet no decisions have been made. They were also frustrated that the city didn't inform them sooner about the proposed routes, especially those whose property would be impacted directly. Many people noted that the proposed road was not disclosed to them when they purchased their home in the area. Grand Parkway (assuming that northernmost option is selected, could be an alternate route for those that would use Brittany Bay - feasibility of this would have to be researched, and Grand Parkway could very likely impact many more people than Brittany Bay). End Brittany Bay extension at 528 and resume it at 2351. (this would avoid impact to people between 528 and 2351, but may cause traffic issues on Sunset, 518 and other roads in the future). Don't build Brittany Bay Extension, and use funding allotted for project to rebuild/rejuvenate empty commercial properties along 518 and other areas in Friendswood instead. Citizens noted that there are MANY abandoned buildings in Friendswood, so if more commercial business is needed, why not provide incentives for using existing commercial property, rather than forcing new construction? A few citizens also stated that they would rather pay higher taxes and deal with increased traffic than to have to sacrifice their sense of security. Council Members Laura Ewing, John LeCour, Tracy Goza, and David Smith were present at the meeting. Each member said they wanted to minimize impact to citizens, but were still in the "data gathering" mode to determine whether the road was needed, and if so, which route would be best for all citizens. Laura Ewing stated that she personally would not vote for the red route. John Lecour stated that he ran on a platform of family values and was opposed to building any route. Three candidates for city council (Jim Hill, Jay Horecky, and Mike Sharp) were also present at the meeting. Dan Johnson said he plans to speak to TxDOT this week regarding the possibility of ending the Brittany Bay extension at 528 and resuming it at 2351. This will obviously be a hot topic for upcoming city elections, so there will likely be more city council and public meetings on the proposed Brittany Bay Extension in the near future - so stay tuned! The cities of League City and Friendswood, in conjunction with the Houston District of the Texas Department of Transportation (TxDOT), are considering the proposed extension of Brittany Bay Boulevard from Algoa-Friendswood Road to FM2351, a distance of approximately 4 miles. Extend Pearland Parkway to 2351 and Brittany Bay Blvd to 528, but don't connect them (no extension between 528 and 2351) - This may not be an option, but the idea was tossed around at the 3/20/06 City Council Special Session, and the Mayor has requested that inquiries be made to TXDoT to see if this is a viable option. To see an enlarged diagram of the proposed "yellow" and "red" route options please click here. The current Friendswood Major Thoroughfare Plan has a route somewhere between the "purple" and "red" routes shown on the map presented in the February 20, 2006 City Council Presentation (shown above). The original purple route had to be modified slightly since retention ponds are now in areas that the route was supposed to pass through. 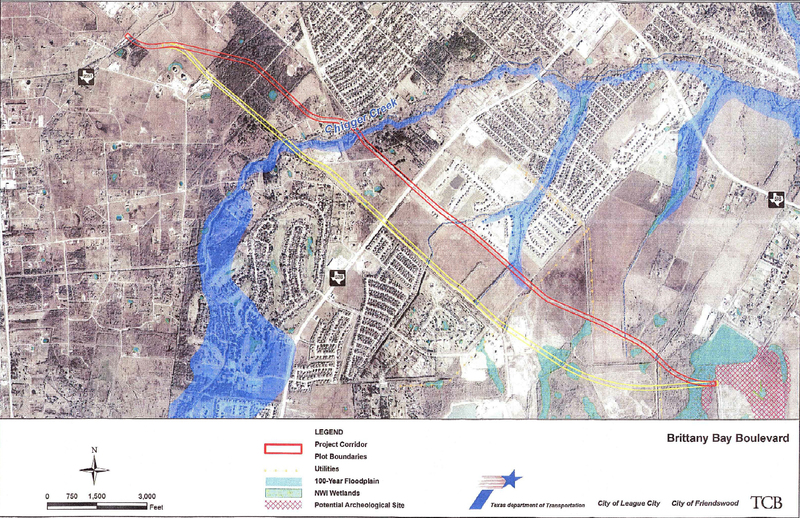 The Friendswood Major Thoroughfare Plan also shows the extension of Wilderness Trail Drive and Falling Leaf to intersect with proposed Brittany Bay extension. Each of the options above have their pros and cons. A presentation was given at the 3/20/06 City Council Special Session describing these pros and cons. The City Council has repeatedly stated that they intend to do all in their power to minimize or eliminate the displacement of homes with this project; however, each option will likely impact homeowners in the area to some degree. The long term affects of traffic flow in Friendswood must also be considered, as Friendswood, League City and Pearland continue to grow, so will the traffic. During the 3/20/06 Council Meeting, Mayor Pro-Tem, David Smith, proposed that the yellow and red routes be removed from consideration to help ease concerns of those affected by these routes. 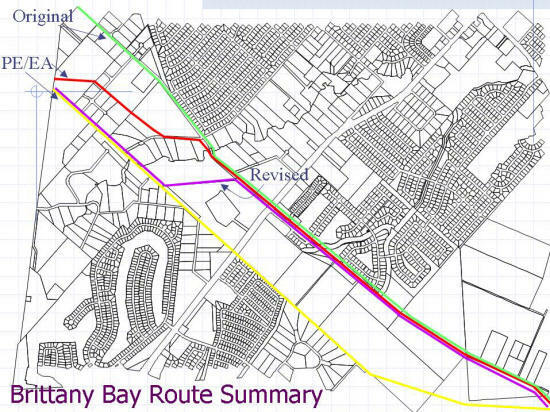 However, it will take approximately 7 months for the Preliminary Engineering/Environmental Assessment (PE/EA) to be completed to determine if the purple route is a viable option. After a preferred route is assessed, it could be 4 years or more before construction on the chosen route would commence. During the 3/20/06 City Council Meeting, City Council Member, Chris Peden, proposed that a non-binding public vote be held during the next election for governor, to get input from Friendswood citizens to see if they felt the Brittany Bay extension is even needed at all. Further investigation of these options was requested, as well as a follow-on special session with homeowners in the affected neighborhoods. However, no dates have been specified yet.